Two very old Nooitgedagt chisels. I found these two very old Nooitgedagt chisels from the late 60's on Marktplaats (that translates to Marketplace), a Dutch auction site. That was a time when Nooitgedagt made chisels that could rival the very best (and these old ones can still rival the very best). They both have the J.N.J logo stamped in the steel and laminated blades, a hard cutting layer backed by a softer layer for strength. The remaining blade length on the one with the red handle is 14cm, the wooden handled one has 18cm left which is enough for years to come. I bid on them during my lunch break and 10 minutes later I got a message back that the offer was accepted. Bought them both for €70. Re: Two very old Nooitgedagt chisels. Nice!!! isn't there a Chisel maker from some years back that used a Fish or Shark emblem and were made in Denmark or other Scandinavian country? Those were pretty good too from what I remember. That was Erik Anton Berg from Sweden and he used a shark logo. These Nooitgedagt chisels are almost exact copies. They have the same Eskilstuna steel for the cutting edge. The main difference is that E.A. Berg never made laminated blades as far as I know. They both also suffered the same fate. Berg was bought by Sandvik and Sandvik was later bought by Bahco and the production of Berg chisels was stopped. 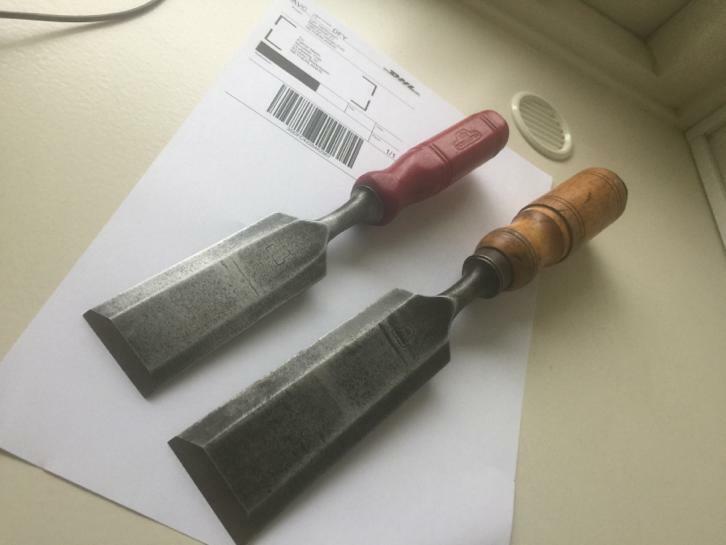 Nooitgedagt was bought by Record and Record was bought by Newel Rubbermaid and they stopped the production of Nooitgedagt chisels. It's a shame because both made excellent chisels in their heydays. This set sharpens up well and I think it has Chromium Vanadium in it as it doesn't have the patina like the ones above. They work well for me and I like them. I received my two new chisels today and didn't have to do a thing except to sharpen them. Both chisels had a 35 degree bevel which is way to high for me so I re-ground them to 28 degrees. They both also have a slight hollow in the back and that's just the way I like it because it considerable speeds up sharpening. And the edge on this steel is amazing, extremely sharp and holds a long time.